Long out of the game, Puma is returning to basketball in a big way. The German shoe brand announced Monday that it has named Jay-Z to a high-profile role with Puma Basketball. “I can confirm that according to his deal with Puma, Jay-Z’s official designation is Creative Director,” said Adam Petrick, global director of marketing and brand for Puma. Jay-Z, the famed rapper and mogul, will be in charge of creative direction for marketing campaigns, and will also be involved in identifying ideal NBA players for the brand to sign. “It’s clear that we’re looking at basketball through the lens of culture, and thinking about the fashion of basketball, the music of basketball – all the aspects of culture around basketball, all the aspects of culture around basketball as much as the on-court presence that we will have,” continued Petrick. Puma has wasted no time in signing new endorsers. Already, a trio of likely lottery picks have signed deals with the brand. On Friday, Duke star Marvin Bagley III signed what is reported to be the most expensive rookie shoe deal since Kevin Durant in 2007. Bagley is expected to feature heavily in several upcoming brand global initiatives. Joining Bagley are fellow top prospects Deandre Ayton and Zhaire Smith. 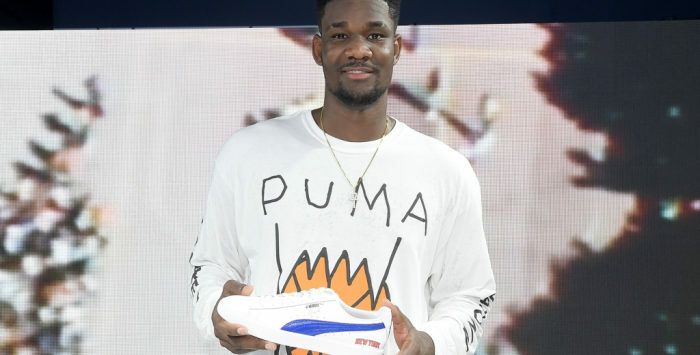 The Bahamanian Ayton cited Puma’s connection with fellow Caribbean endorsers Usain Bolt and Rihanna as an influence on his decision. “I’m an entertainer,” Ayton continued. “Puma knows entertainers and the way we move. Puma has not been affiliated with an NBA player since Vince Carter wore their shoes on his feet in his early high-flying Raptors days. However, the company’s roots in the game go back much further, with Hall of Fame point guard Walt “Clyde” Frazier launching Puma’s first signature basketball shoe in 1973. Frazier, a longtime Knicks broadcaster, has been signed to a lifetime contract to coincide with the brand’s return to basketball.